Exc’elle Mosaics is a small gift shop and mosaic studio for classes. All glass and tiles are hand cut. I work with various mediums such as stained glass, glass tiles, plates, ceramic etc. In the gift shop you will find new, vintage and re-purposed items such as candle chandeliers, fine art, signage, bird baths, small tables, gazing balls etc. Custom work is welcome and is the bulk of my business. Mosaic business signs completed for Natures Friends of Hospice on West Rd in Greenville, NY. 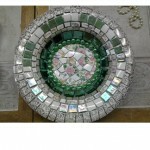 Mosaic retail gift shop, mosaic classes, custom mosaics.